This Hubble Telescope image shows a doubly-imaged quasar, which can be used to measure the Hubble constant. A new technique of measuring the Hubble Constant from such doubly-imaged quasar systems could help astronomers better understand how the universe's expansion rate has changed over time. Something isn't quite right in the universe. At least based on everything physicists know so far. Stars, galaxies, black holes and all the other celestial objects are hurtling away from each other ever faster over time. Past measurements in our local neighborhood of the universe find that the universe is exploding outward faster than it was in the beginning. That shouldn't be the case, based on scientists' best descriptor of the universe. To nail down Hubble's Constant, scientists had previously used several different methods. Some used supernovas in the local universe (the nearby part of the universe), and others have relied on Cepheids, or types of stars that pulsate and regularly flicker in brightness. Still others have studied the cosmic background radiation. "No matter how careful an experiment is, there can always be some effect that is built into the kinds of tools that they're using to make that measurement. So when a group comes along like this and uses a completely different set of tools… and gets the same answer, then you can pretty quickly conclude that that answer is not a result of some serious effect in the techniques," said Adam Riess, a Nobel laureate and researcher at the Space Telescope Science Institute and at Johns Hopkins University. "I think that our confidence is growing that there's something really interesting going on," Riess, who was not involved in the study, told Live Science. Here's how the technique worked: When light from a quasar passes an intervening galaxy, gravity from the galaxy causes that light to "gravitationally bend" before hitting Earth. The galaxy acted like a lens to distort the quasar's light into multiple copies — most commonly two or four depending on the alignment of the quasars in relation to the galaxy. Each of those copies traveled a slightly different path around the galaxy. Quasars don't usually shine steadily like many stars. On account of material falling into their central black holes, they change in brightness on scales of hours to millions of years. Thus, when a quasar's image is lensed into multiple copies with unequal light paths, any change in the brightness of the quasar will result in a subtle flickering between the copies, as light from certain copies takes a touch longer to reach Earth. From this discrepancy, scientists could precisely determine how far we are from both the quasar and the intermediary galaxy. To calculate the Hubble Constant, astronomers then compared that distance to the object's redshift, or the shift in wavelengths of light toward the red end of the spectrum (which shows how much the object's light has stretched as the universe expands). 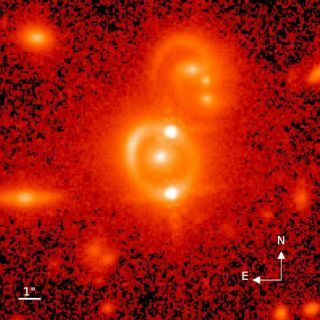 "Images of quasars that appear four times are very rare — there are maybe only 50 to 100 across the whole sky, and not all are bright enough to be measured," Birrer told Live Science. "Doubly- lensed systems, however, are more frequent by about a factor of five." The new results from a doubly-lensed system, combined with three other previously measured quadruple-lensed systems, put the value for the Hubble Constant at 72.5 kilometers per second per megaparsec; that's in agreement with other local universe measurements, but still around 8 percent higher than measurements from the distant universe (the older, or early, universe). As the new technique is applied to more systems, researchers will be able to home in on the exact difference between distant (or early) universe and local (more recent) universe measurements. "The key is to go from a point where we're saying, yeah, these things don't agree, to having a very precise measure of the level to which they don't agree, because ultimately that will be the clue that allows theory to say what is going on," Riess told Live Science. As for explaining what possibly exotic physics might explain their mismatch in expansion-rate measurements, that's way down the line.